Some examples of results achieved by our clients. We've worked with hundreds of companies, large and small to achieve positive results. In the past, SEO was fixated on ranking high for a few highly searched keywords. However, with modern search engines being able to deliver different search results for different users on different devices, page 1 rankings for just a few keywords are not a viable SEO strategy. A more sustainable SEO strategy focuses on improving your footprint in organic search. This means getting found for an increasing number of highly relevant keywords used by people all along the buyer's journey. From initially looking for solutions to problems to looking for local suppliers. Here is a small sample of some of the brands we've worked with to improve their online results. Petal & Pup is a young leading fast growth e-commerce fashion brand that had built a strong business leveraging the power of paid facebook & Instagram advertising. However, whilst they had a super strong following and a ton of branded search volume, they had very little non branded keyword visibility. And the reason's were pretty obvious. As they had grown their business using Facebook Ads, very little attention had been given to the SEO fundamental's. The site had a very simple product category structure and a weak backlink profile. Together with our agency partner, Neural Digital, we implemented a three month SEO Foundations campaign which focused on the following steps. Given that we only had three months to work with, our focus was on activities that could be implemented quickly, that would have immediate impact and that would provide ongoing benefit to the site long term. 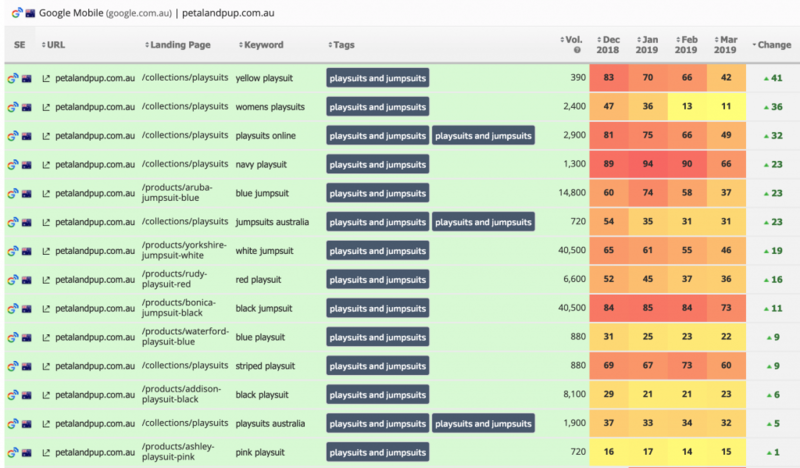 After an extensive analysis of their products and their competitors, we identified a huge range of possible keyword opportunities and redesigned their category structure to enable them to create and optimise new pages to target these keyword opportunities. Whereas previously, they had less than 10 top level product categories such as Women's Dresses & Playsuits, we expanded them to more than 20 and optimised the pages accordingly. In addition, their home page was not ranking for market defining keyword terms such as "Women's clothing"
Once we had decided on the relevant categories to create based on their product catalog, we leveraged the features of Shopify Plus to allow us to quickly create and populate these new categories. Shopify has a very handy feature called Automated Collections which allows you to create categories using product tags. 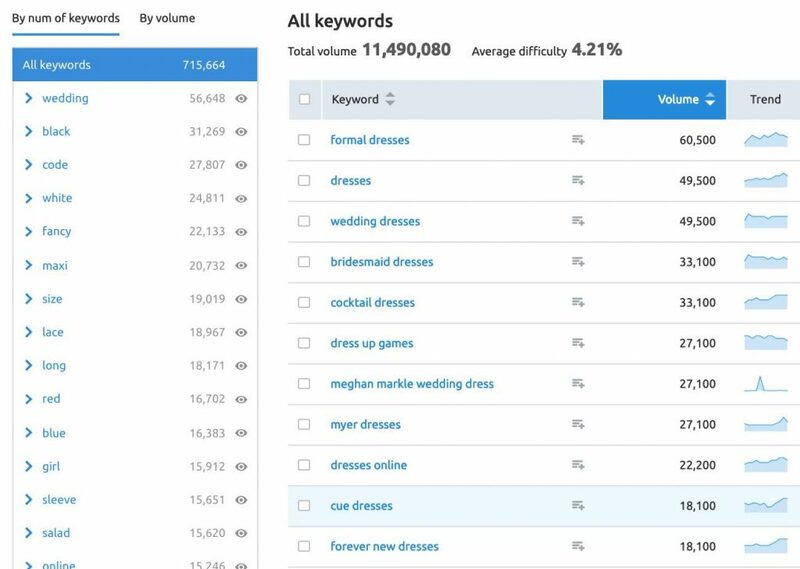 So we simply said, create a new category called "maxi Dresses" by choosing products that had the product category "Dresses" and the product style "Maxi"
Once the categories were created we then wrote compelling keyword rich page titles and meta descriptions. This process is called on page optimisation and involves writing keyword rich but conversion focused page titles and meta descriptions, as well as making the there is sufficient, relevant content on the pages and that the page was logically structured. Another challenge we faced with Shopify was that it has a flat category structure and does not allow you to nest sub categories beneath top level categories. We had to develop an updated menu structure and internal linking strategies that made this product hierarchy obvious and helped get these new internal category pages linked to and ranking. On e-Commerce sites, the valuable entry points are the category pages. In order to make them worth ranking we need to add content to them to make them more unique and compelling. We worked with the developer to enable content blocks on the category pages which were previously content free, and then mapped out a plan of content writing to add unique content to the category pages. Shopify is set up in a way that there can exist several different URL's to product pages. This is called a duplicate content issue. Shopify handles this by using a Canonical tag which tell's Google which is the "one" or true URL to rank. However we had seen several implementations of this that were broken we we comprehensively audited and tested this functionality on the site. For a brand with such a strong branded search volume, the site had a very weak link profile. We worked with a range of third party blogs and publishers and secured a number of sponsored authority link placements to help "kickstart" the backlink growth, pending the development and implementation of an ongoing and systematic outreach and promotional strategy. Typically we work with e-commerce brands for a minimum 12 month period which allows us to see high keyword visibility translate into traffic and sales. 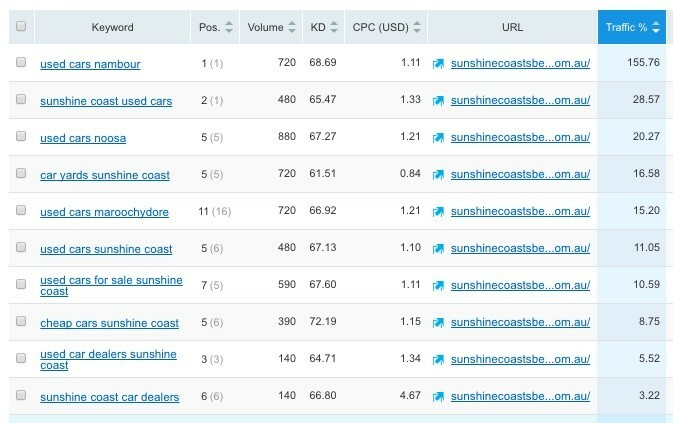 New Keyword Rankings: Is the site now ranking for category level, transactional keywords that it was not previously ranking for? Increased Keyword Visibility: as measured by Google search console impressions and third party tools like SEMresh. If you're looking for similar results for your business you should Contact us and we can discuss whether your business is a suitable candidate for one of our campaigns. Fishburners is a not-for-profit that's famous for its high quality startups and world-class community. It houses Australia's largest community of scalable tech startups. In 2018, with the opening of their new co-working facilities in Sydney it had an urgent need for new membership leads to help fill the new offices. The marketing team also had the responsibility for myriad other initiatives and needed the help of a specialist team with experience in lead generation using digital marketing. Once we had audited the site and marketing assets of Fishburners we implemented the following actions. After a comprehensive workshop with the marketing team we concluded that the key to signing new members was to get them to conduct a tour of the facilities. We reverse engineered their path to membership and set up proper marketing funnels in order to give us the most chance of success. The primary goal of all paid traffic and organic traffic initiatives was to drive inbound tours and membership applications. The existing Google Analytics implementation was not configured in a way that make it easy to track not only inbound membership inquiries but also the key steps that occurred before a membership application was submitted. We implemented Google Tag manager and started tracking all of the key conversion actions on the site which allowed us to properly track and measure the effectiveness of our marketing activities. We found that there were problems in the Sydney location with the Google My Business listing not appearing. 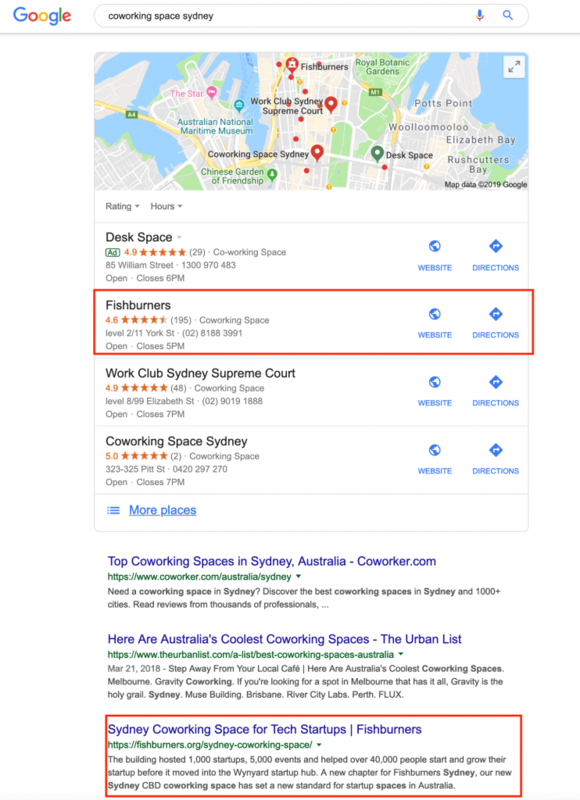 We configured the local landing pages, updated all of the directory links and citations and within a month we had a dual page 1 ranking for "Coworking space Sydney" with the business appearing in both the maps and organic results on page 1. Another key challenge was that the landing pages and calls to action on the site needed to be updated to match the lead generation strategy that was being followed. We provided advice and guidance to update key content elements on the site to drive tours of the premises that would typically lead into membership applications. The final piece of the puzzle was the implementation of a paid traffic . generation campaign using both Facebook and Google Ads to bring targeted traffic to the site and to retarget those visitors who had downloaded lead magnets created for this purpose. With the implementation of a proper tracking and measurement system the marketing team now had much more insightful data on how their website was functioning as a lead generation platform. In addition, the improved organic visibility in Google, when combined with the paid traffic campaign and high converting landing pages allowed Fishburners to achieve their membership goals within their desired timeframe. 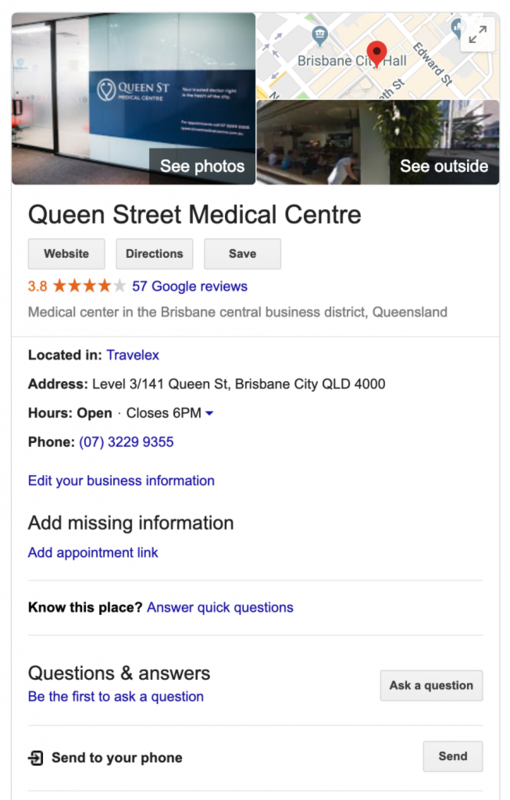 Queen Street Medical Centre came to us with no website and no online visibility. Without a visible website, they relied on referrals and traditional patient generation strategies like the Yellow Pages. 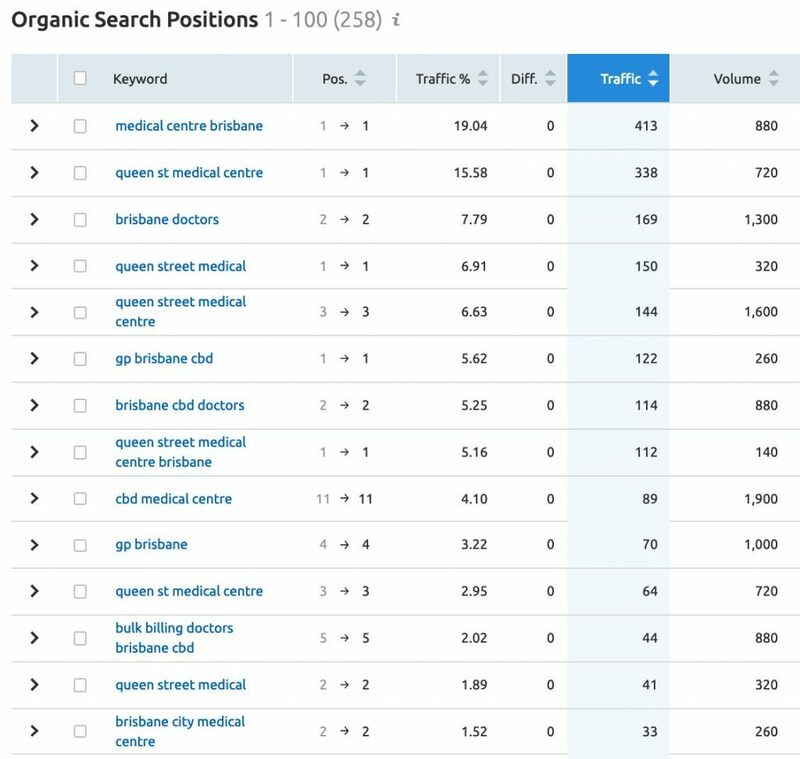 Given the central location of the business right on the Brisbane City Mall, we felt that with the right technical foundations, they should be able to expect strong visibility in local search within Brisbane for their services. The key to getting them found online was understanding that as a local business, the majority of their customers were going to be within walking distance of the practice. Workers in the CBD typically visit a doctor in their lunch hour so most are looking for a close, local practice to go to. 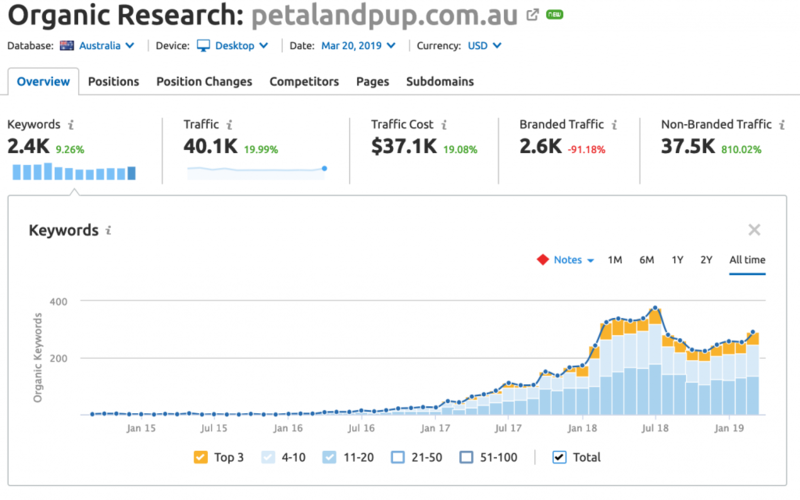 We implemented our SEO Foundations campaign which has the goal of ensuring that all of the key elements for success in organic search are in place. 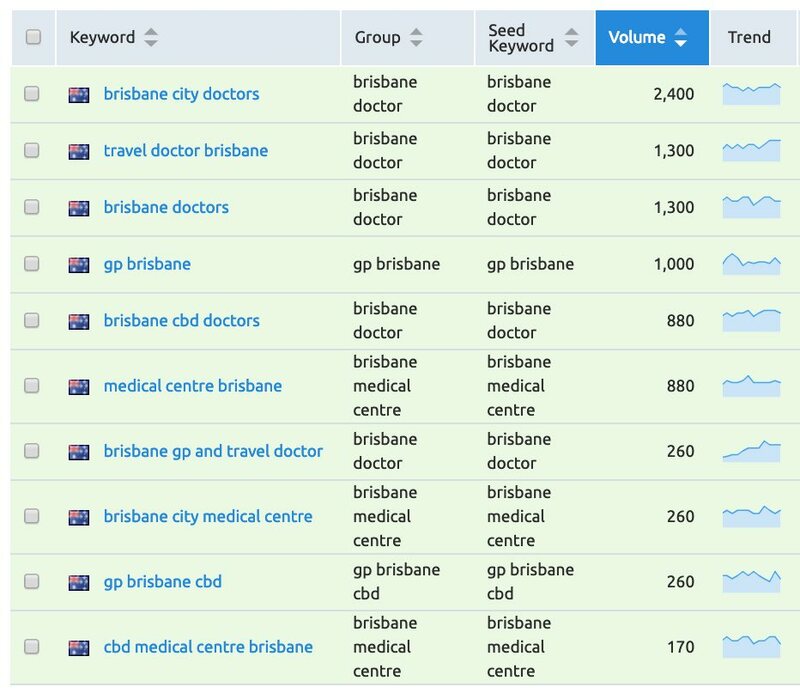 Our keyword research identified several ways people in the Brisbane CBD searched for a local doctor or medical practice. The next step was simply to optimise the pages of the site so that Google would rank them accordingly. The next step was to add the business to Google's own My Business system. This is how you get your business in Google Maps and allow Google to better understand "who" you are and "where" you are located. The next step involved building out high quality local links and citations to send external signals to Google that this in fact was a real business and that the name, address and phone number on these listings correctly matched the entity we had set up in Google My Business. Ultimately, the only results that matter are increased patient bookings. However we are able to track and measure the impact of our SEO work my monitoring data points like growth in # of keywords ranking, ranking positions, increased keyword impressions in Google search console and of course, organic traffic growth. Sunshine Coast's Best Used Cars recently launched a completely new website to serve the Sunshine Coast's demand for used cars. Our focus was on ensuring that technical fundamentals were in place, the site was properly optimised and that the site had proper visibility in local search and rankings in its target market. They are about to roll out a content and video strategy to help them continue to grow their online audience. 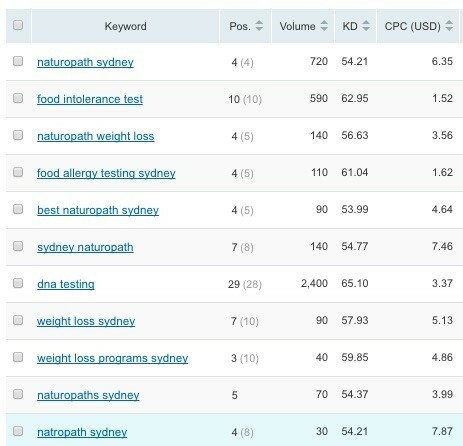 This Sydney Naturopath was ranking off page 1 for it's primary keyword phrase and wanted visibility for additional keyword phrases relevant to the business. Our campaign ensured that the site was optimised for the most relevant, local keywords, ensured the site had visibility in the Google My Business system and then focused on acquiring quality local links and citations to help the site rank in its target market. 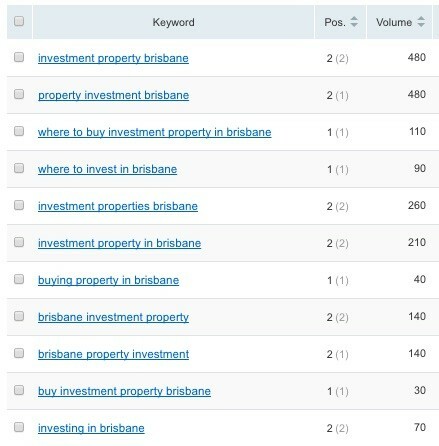 This small business was looking to get some traction in the Property Investment space in Brisbane. We researched and helped them develop a piece of content to target an audience of people looking for property investment options in Brisbane. With some promotion, this post now generates rankings for many highly relevant keywords. This organic traffic is remarketed to and offered the option of participating in property investment webinars. Are you looking to get results like these? Here's what to do.